SB Rail’s fleet of on-track machines are reliable and efficient. We offer a full range of track maintenance and renewals equipment, including high output plain line and S&C tampers, track finishing machines and specially developed rail cranes with multi-purpose attachments. Browse our various machine and service categories below. 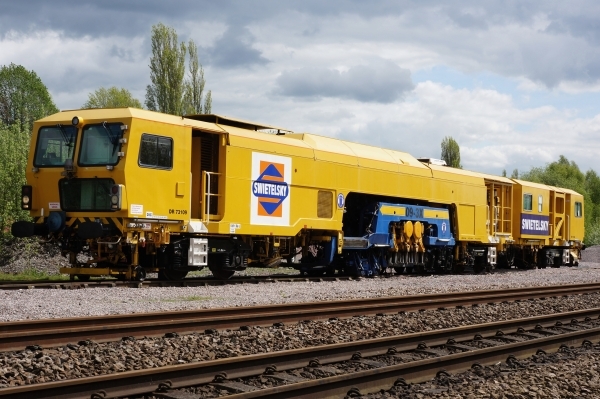 SB Rail’s fleet of tampers is the most comprehensive in the market, providing a complete range to suit all track types as well as individual site or programme requirements. Our latest machines enable high output continuous action tamping and lining through S&C as well as plain line, together with integrated Dynamic Track Stabilisation (DTS). Our ‘Sprinter’ equipped tampers are the ideal tool for smaller, isolated faults, whereas our 09-3X machines are the preferred option for large volumes of plain line. Browse our range of tamping machines below. SB Rail’s track finishing machines include the USP 5000 and Automatic Finishing Machine (AFM). The USP 5000 is designed and built to efficiently regulate track ballast and achieve compliant profiles. Our AFMs take this to the next level, offering a more comprehensive ballast management solution together with integrated Dynamic Track Stabilisation (DTS). In addition, our AFMs are equipped with ballast profile scanning devices for rapid identification and rectification of non-compliant track sections. Browse our track finishing machines below. SB Rail has continued to invest in Dynamic Track Stabiliser (DTS) technology. Our Automatic Finishing Machines (AFMs) and 09-4×4/4S Dynamic tampers each feature incorporated DTS units. The DTS exerts a vertical load and lateral vibration to consolidate the track system, simulating the passage of trains. The dynamic effect causes a ‘flowing’ movement of the stone, allowing it to settle more closely together, reducing voids. The improvement in consolidation is one of several products allowing track to be safely opened to traffic at higher hand-back speeds than would otherwise be possible. Browse our DTS equipped machines below. SB Rail’s cranes are multi-task machines enhanced by a series of attachments making them safer, faster working and more versatile. Our specialist attachments include: a robotic arm, automatic sleeper relaying beam, tandem tension system and configurations for electrification works, including a high output piling system and mast/boom installations. Browse our crane options and configurations below. SB Rail integrated its unique robotic crane arm with a side-insertion ‘vibro’ piling unit forming a powerful yet highly-versatile system, dubbed the Electrification Piling Train (EPT). Integrated flat wagons fitted with custom bases and frames are used to transport piles from depot to site, forming an entirely self-contained system deployed in a high output production-line methodology. Our fleet of cranes are also able to install electrification masts, portals and booms. Browse our electrification capabilities below. Contact SB Rail for further information or general enquiries.